Written by Will on May 12, 2012 and posted in Game Art. 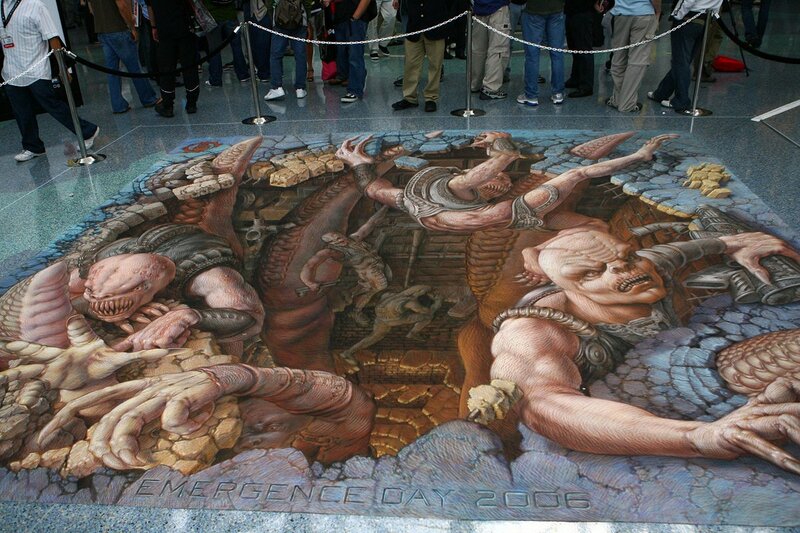 Gears of War: Emergence Day 2006 – Kurt Wenner – E3 Expo L.A.
Back in 2006 Microsoft hired Kurt Wenner to create a Gears of War chalk drawing on the floor of the E3 Expo in L.A. It depicts Locust emerging from a sink hole as they do in the game. It was a massive hit with the gamers at E3 and even now it’s still a big hit with me. It was drawn over the course of 5 days in L.A. in the pavement art style that Wenner is known for. If you visit his site and check his résumé you’ll see he’s worked for a lot of other big names too. People like Warner Bros. and Kraft have commissioned him but he has also had his art work visited and signed by The Pope! Here’s what it says in Wenner’s resume. Gamers and Journalists alike enjoyed walking around, and indeed over, this Gears of War Emergence Day 2006 mural. The first time I seen a picture of this I thought it was 3D models, the artist has captured the light absolutely perfect and the perspective is spot on. If I had a lancer in my hands I’d have shot at the screen it looks so damn real! When Gears was a hit from launch and has since released 2 highly successful sequels, the latest – Gears of War 3 – was just last year in 2011. In the end the Locust, and the Lambant (initially in Gears 2), problem was quashed and no Sera no longer has to worry about the destruction they will cause. Update: The next Gears of War game is Gears of War: Judgement. Developed by the Bulletstorm creator: People can Fly. People can Fly was recently acquired by Epic Games a few months after the announcement of Gears of War Judgement. Check out the Gears Judgement announcement. Epic have stated that this is not the last of Gears and the only logical conclusion is that it will be a prequal. It has been hinted at with the “RAAM’S Shadow” DLC where you take control of Zeta team, and RAAM himself! The RAAM’S Shadow DLC takes place on Emergence Day but towards the end of the Gears 3 Campaign there are some more revelations that come to light. Revelations that E-day was know about long before it happened and that Locust contact and even co-operation had happened before that day. Here’s a time-lapse video of Kurt’s Emergence Day 2006 released by Microsoft followed by a gallery of close up pics of the painting at various points.